I have played both acoustic and electric guitar since I was 11. 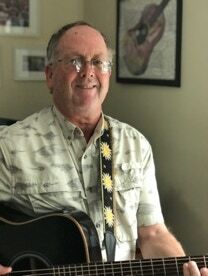 My early musical influences were late 60s-1970s folk rock from the Eagles, Creedence, Santana, Byrds, Crosby, Stills and Nash, Doobie Brothers, Eric Clapton, and Simon and Garfunkel. My years at Stonehill College exposed me to many new musical influences: the great blues of B.B. King, Bonnie Raitt, and the Fleetwood Mac blues years with Peter Green. Then, songwriters such as Joni Mitchell, the Grateful Dead, Jackson Browne, Neil Young, James Taylor, Dylan, The Band, Cat Stevens, and the acoustic blues of Taj Mahal. I discovered altered tunings. As luck would have it, a fellow student down the hall was adept at the fingerpicking blues/ragtime style of Reverend Gary Davis, having apprenticed under the Reverend himself. So I was off and running with acoustic fingerpicking, which works out nicely in a solo setting. After college, I worked for 10 years in a general business/wedding band playing lead guitar and singing. We covered swing, disco, Motown, Rock and Country....loads of fun. Then the music scene changed and I decided to downsize my act. I began the duo SEABREEZE in 1988, which has been a popular musical staple on Cape Cod for 30 years. About 1993, to complement my duo work, I began doing solo gigs to showcase my acoustic skills, incorporating the harmonica (think Bob Dylan/Neil Young) to diversify my sound. Over the recent years, solo has become my “bread and butter”, and I thoroughly enjoy this aspect of performing. I have now begun to play both dobro and banjo for enjoyment, and have found that my right hand guitar fingerpicking ability has made conversion to these instruments easier.